Cogswell (P) - Medically grounded after aborting a mission on 04 Oct 43 due to back injuries during the bail-out. Transferred to Squadron/Group Operations. Cogswell, then a Major, was KIA in a B-29 crash in the Sea of Japan during the Korean War. Kennedy (B) - last mission (16th) on 08 Sep 43. Stamper (TOG) - Completed combat tour 07 Jan 44. Bengston (E) - Last mission (18th) on 04 Oct 43 shortly after bail-out on 26 Sep 43. Deerfield (R ) - Completed combat tour of 30 missions on 11 May 44. Wounded by shrapnel on last mission when flak burst penetrated Radio Room. Etheredge (RWG) - Last mission (13th) on 27 Aug 43. Transferred to M/Sgt Robert B. Heiliger ground crew. Died on 22 May 45 in 303rd Station Hospital from a lower spine tumor. Kistulentz (R ) - Flew no missions with the 360BS Cogswell Crew. Was replaced by T/Sgt Eddie Deerfield. First ten mission with the 360BS George Stallings Crew (#51 - 17 July 1943) and two with the 360BS Carl J. Fyler Crew. Was then transferred to 358th BS. 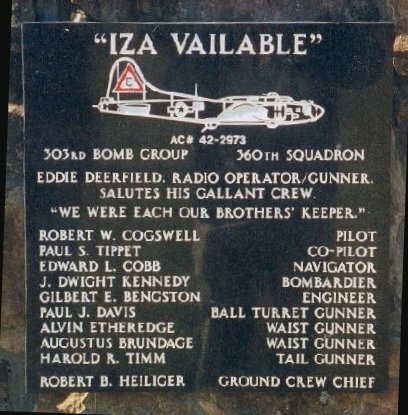 Flew mission #101 (29 Jan 1944) with the 358BS Walter W. Troppman Crew, mission #105 with the 358BS John F. Henderson Crew and then his thirteen final missions with the 358BS Jack W. Watson Crew. 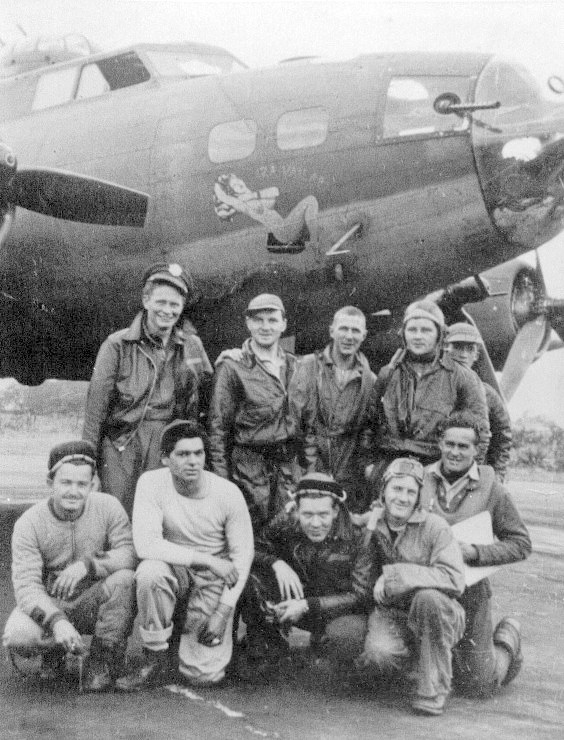 The Cogswell Crew was the only 303rd BG(H) crew to have survived a Ditching, Crash Landing and Bail-Out. Five of the original crewmen were aboard on all three of those missions. They were Capt Cogswell (P), Lt Cobb (N), T/Sgt Bengston (E), T/Sgt Deerfield (R) and S/Sgt Davis (BTG). Ditching - 30 July 43 mission #56 to Uschlag, Germany in B-17F #42-29738 Upstairs Maid 360BS (PU-I). 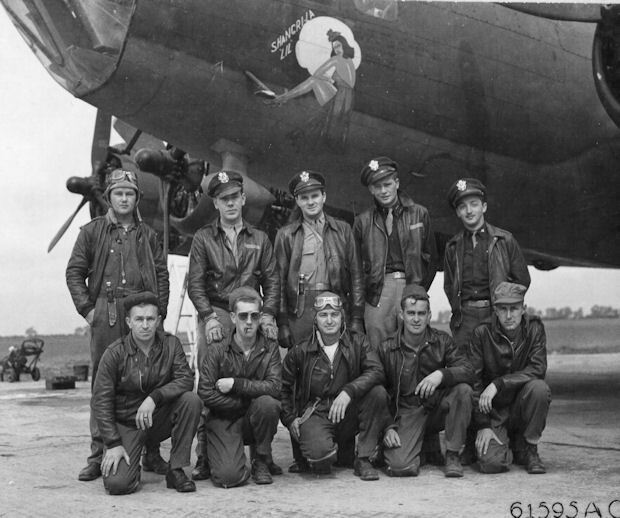 The B-17 was attacked by German fighters. Capt Cogswell had feathered the #4 engine and dropped behind the formation after leaving the Dutch Coast with only two engines operating. The aircraft was ditched about 22 miles from Felixstowe when another engine ran out of gas and sank in about two and one-half minutes. Air Sea Rescue arrived after 35 minutes and picked up the crew from their life rafts. Lt Cobb had injuries to his head, left leg, right hand and tooth. Substitute crewmen were: S/Sgt Elmer L. Peterson (LWG) for Sgt Brundage; CoPilot was Lt Tippet. Crash Landing - 27 Aug 43 mission #64 to Watten, France in B-17F Iza Vailable 360BS (PU-G). The B-17 was badly damaged after fighter attacks. #1 engine controls shot away, #2 engine on fire and had to be feathered, #3 engine oil lines were knocked out. An emergency landing was made on the extra wide "Lame Duck" runway at Manston, Kent, England. All men were safe. Substitute Crewmen were: S/Sgt E.L. Peterson (LWG) for S/Sgt Brundage, Lt De Wall (CP) for Lt Tippet. Bail Out - 26 Sept 43 recall mission to Nantes, France in B-17F #42-5434 Lady Luck aka Bob's Boudoir aka Shad Rack. The B-17 suffered a runaway prop and fire on the #4 engine which could not be feathered. The crew was ordered to bail out when it appeared that the wing had become loose. Cogswell rode the Fortress down to a few thousand feet to make sure that it didn't crash in a populated area. Lady Luck crashed near the Medstead Airdrome near Winchester. The bombs didn't explode. Lt Cogswell tore the ligaments in his back when he bailed out at a high rate of speed and low altitude and was medically grounded after aborting a mission on 04 Oct 1943. On my way to enemy territory I lost an engine, which isn't unusual, but complications set in. The engine set up such a vibration that structural failure was started in the wing. I told the crew to bail out and went on by myself to find an airdrome at which to set her down. Oh yes, the bombs were still on board and ready to go off at the slightest jolt. I couldn't jettison them because I was over England. I also knew the wing was liable to leave at any time. The Yankee almost made it, but at about 2,000 feet, the engine cowling went and the wing tip started to curl up. At first glance, I couldn't find an open area at which to point the ship and thought I'd have to ride it in to avoid loss of life and property. But, almost by miracle, the open area appeared. I was almost too low to jump by this time, but tried it anyway. It worked though, because I'm still here. The plane exploded so near that I could feel the heat of the blast in my face. No one was killed or injured, no property was damaged (except a few cabbages) so once again I thank God for divine assistance. A plaque to the memory of Capt Cogswell was unveiled at the Globe Inn, Alresford, England in November 1943. Substitute crewmen were: Lt D.E. Kendall (CP) for Lt Tippet; Lt F.E. Kulesa (B) for Lt Kennedy; T/Sgt E.L. Peterson (LWG) for S/Sgt Brundage; S/Sgt S. Oxendine (RWG) for S/Sgt Etheredge; S/Sgt J.P. Deffinger (BTG) for S/Sgt Timm (TG) . 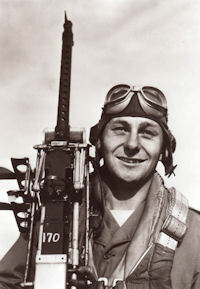 S/Sgt Davis flew as Tail Gunner.